I was a fairly ambitious teenager. One summer, I wrote a couple nearby golf courses asking for a job. I told ’em that I’d work for free – all they had to do was give me free golf. Sound like a deal huh? I thought so. Fortunately enough, of those 2 letters I sent out, one called me up. I met with John (not his real name) and we hit it off. He was the teaching pro at the course and he wanted an assistant. The assistant would set-up for his lessons each night and then track down the golf balls the students would send flying every which way. It would be a dangerous job, but somebody had to do it. I was hired and – since the course didn’t give away free golf – was paid an hourly rate. However, many nights after work, the teaching pro and I would jump on the course and play a few. It was a great, unique summer job. Today, it seems teens are struggling to find a job. The Wall Street Journal reported the rate of teen participation in the labor force during the month of July peaked in 1978 at 72%, falling to 43% last year. While some may debate whether it is a good idea for a student to have a job when enrolled in school – most wouldn’t argue against a summertime gig. Which got me to thinking about some unique and cool jobs teens could do today. With the job market being a little tighter, creativity will go a long ways. I actually got this idea from my mom. She lives in a small town and there are a lot of older folks who still aren’t online OR aren’t very computer savvy. A kid could deliver some postcards around the neighbor – preferably targeting the older neighbors – and tout his/her service of listing items the person would like to get rid of in return for a cut of the profits. If word spread of your sales and superb service, this could be quite lucrative. Shark Tank’s, Mark Cuban came up with this on his blog, in a post entitled, “how to make money as a student“. He advises tech savvy teens (I suppose that goes without saying today) to become the go-to expert on popular brands of all-in-one remotes and then to offer their services to program peoples remotes. “No one wants to take the time to learn how to program the stupid remote,” Cuban writes. Produce some biz cards, bring them to your local electronics store and convince the manager to keep a stack there and whenever someone buys a remote, perhaps the cashier can put your card in their bag or let the customer know of your service. You could also provide a small cut of profits for their advertising for you. This may be more appropriate for a larger city, but if you have a way with animals and love dogs, this could be a great gig for you. Advertise on Craigslist, at a nearby pet store and put your service on a card and post it on the bulletin board at church, the community center, library or the supermarket. With more and more of the elder generation getting tablets and smartphones, there is a need for patient people to teach these fine folks the ins/outs of using their devices. A teen could offer classes at a library, advertise on Craigslist and provide business cards to nearby electronics stores. Lots of people are renting out homes because they were/are underwater on them so they don’t want to sell – but needed to move. There’s even a service that is booming here in the Twin Cities called Renters Warehouse that helps these homeowners manage their properties. When new renters leave and others come in, the house needs a good cleaning. I would imagine this would be a great job for a detail-orientated teen who enjoys cleaning. You could also find realtors looking to help homeowners stage and clean their properties for sale. Recently I wrote about how you can be alerted to when free stuff is being given away by your neighbors. An enterprising teen could be alerted of these freebies and grab the good stuff and then resell it. Market economy at its finest! My wife and I recently took a 12-week citizens academy course through the city’s police department. It was great. One of the things they discussed doing is hiring teens to walk into liquor stores to try and make a purchase. What a great gig for a teen! Contact your local police department to see if they are looking for anyone to fill this role. While not steady work, it would be a nice resumé boost to say you worked for the police! I learned about this one through Michelle’s site and thought it was ingenious. This guy makes six-figures contacting property companies to see if they need anyone to come along and pick-up trash / clean up their properties – amazing! Why couldn’t an enterprising teen do something similar. Be a great way to make some money for college and get exercise. 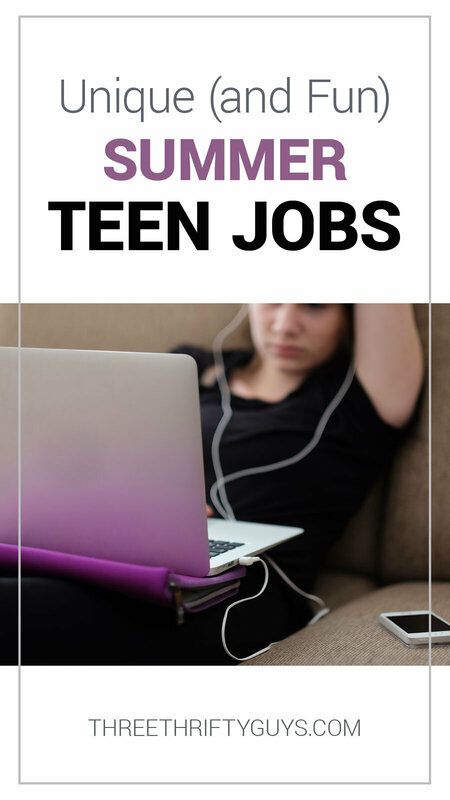 I tried to keep these to more unique and interesting ways that teens could make money this summer (or really, any time for that matter!). We live in a small community so my 12-year (now 13) last year put an ad in a local newsletter that he wanted to earn money to go to summer camp. He had several calls. Many were for yard work but he also had one person ask him to help unload a moving truck, one needed posts painted on her farm and one needed blackberry bushes cut down. He raised all the money he needed for camp, bought a used laptop for $100, bought a used iPad mini for $150 and still had over $200 left in a savings account. This year he is just working for a couple of his lawn care customers that called him as soon as spring came around and he already has his money for camp in the bank. He now knows he can always find a job if he needs to earn money. There are always jobs available if you are willing to work hard get out there and find them. During my childhood days, one of my summer job was to teach other children how to dance. Because I was a dancer before, especially Hawaiian and ethnic dance and I really enjoyed it! Neat way to share your gifting Marie. These are all great ideas Aaron! I think our six year old could do #6, as she knows how to use it better than we do. ;) Seriously though, if they’re entrepreneurial enough, I’d say find a need in your neighborhood – like the dog walking, yard work, watching after a house when people are on vacation and start offering that as a service. I was unemployed for six months and did some of these jobs. I did eBay consignment and it was great because I learned to code HTML and I became a power seller on eBay. Now I get discount on shipping. It’s tricky getting they right type of people because often time what i found with “listers” craigslist or otherwise, it takes a long time to establish trust and a reputation/feedback is always at stake. I have had international dispute via eBay on small details. So beware that everything is disclosed and the transaction/arrangement is clearly thought through before listing for people. You don’t want to be in a dispute over one scuff on a shoe. Yes, I have done this and it lasted two weeks. In the end, eBay sided with me because the seller did not view all the pictures (I listed 12 pictures). Thanks for the advice Allison! Great ideas, Aaron!! We haven’t found our oldest a fun and unique summer job yet, but in the winter, she works with a company that provides reindeer sleigh rides and petting zoos, and she’s a “keeper of the reindeer”. She absolutely loves it! My son is 15, and is looking for a job this summer. It seems to me that a lot more places require you to be 16 to work these days…..he’s having a tough time finding a ‘traditional’ sort of parttime job. He may just have to get a bit more creative…. Yeah, it’s tough out there. Hope he is able to find something! Great time to be entrepreneurial.